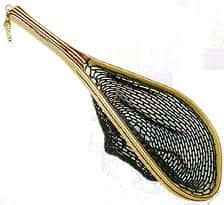 Fisknat Lake Net with lightweight rubber bag - BOW: 10" x 16" HANDLE: 7" OVERALL LENGTH: 23". The Fisknat Lake net is a farely new net we had a hand net named lake before, but we have modified it to fit anglers needs better. I am quite pleased with the net and it will serve me well for years to come. However, I was extremely disappointed that I paid $40 for two day shipping and it took two business days for the supplier to mail the item. I left for my trip early the day the net arrived, I paid the extra shipping to take the net on my trip, NOT to have it sitting on my porch while I was off fishing for 5 days. I'm still giving the net 5 stars because it has nothing to do with the shipping. I probably will not order from here again however.